Three days ago I wrote about the upcoming 14th International Architecture Biennale in Venice and its overall themes. Today I will share with you what to expect from the UAE pavilion and some thoughts and questions. This week, the United Arab Emirates will make its debut at the 14th International Architecture Biennale in Venice, from 7th June till 23rd November 2014 (with a VIP opening on Thursday, 5th June). The UAE first took part in the Venice Biennale in 2009 and after last year’s announcement of a permanent pavilion in Venice, the UAE is looking to make a mark at the Architecture Biennale. The UAE Pavilion is one of the 66 national pavilions (and the 3rd Gulf country after Bahrain and Kuwait) that has responded to the theme Absorbing Modernity put forward by the biennale director Rem Koolhaas. "Absorbing Modernity: 1914-2014" is an invitation to the national pavilions to show, each in their own way, the process of the erasure of national characteristics in architecture in favor of the almost universal adoption of a single modern language and a single repertoire of typologies – a more complex process than we typically recognize, involving significant encounters between cultures, technical inventions, and hidden ways of remaining "national". 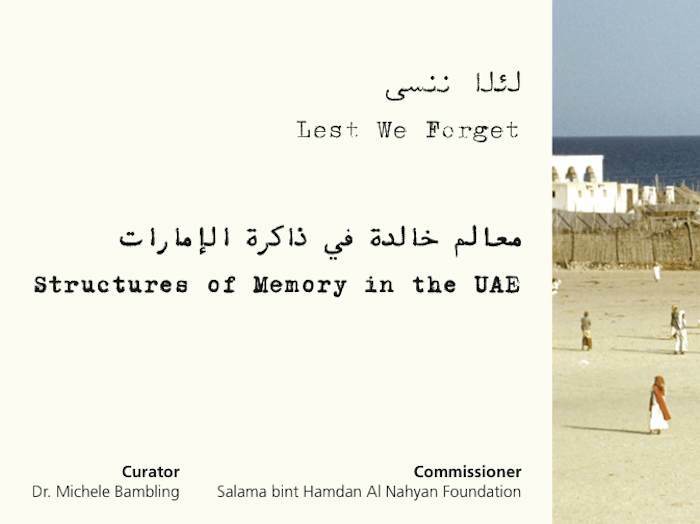 The UAE Pavilion’s exhibition is titled Lest We Forget: Structures of Memory in the UAE, commissioned by Salama bint Hamdan Al Nahyan Foundation and curated by Dr. Michele Bambling. 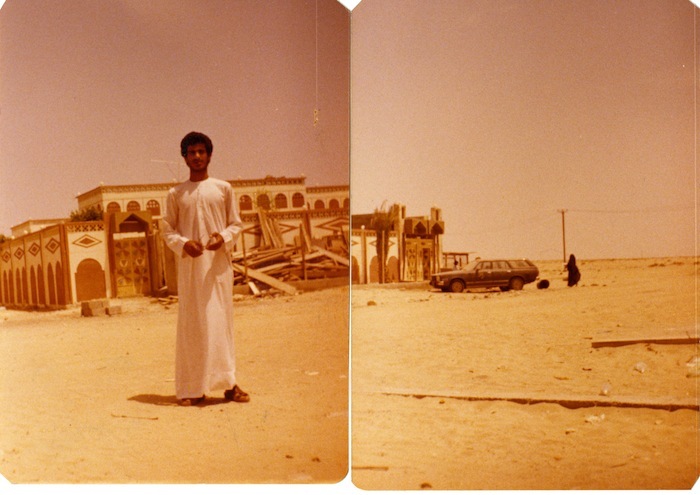 "Lest We Forget: Structures of Memory in the United Arab Emirates" presents the seminal findings of a larger initiative to archive the history of architectural and urban development in the UAE over the past century. With a concentrated emphasis on the 1970s-1980s, the exhibition examines how public and residential architecture, built within a rapidly expanding urban context, shaped the newly established federation and prepared the foundation for its emergence on a global stage. 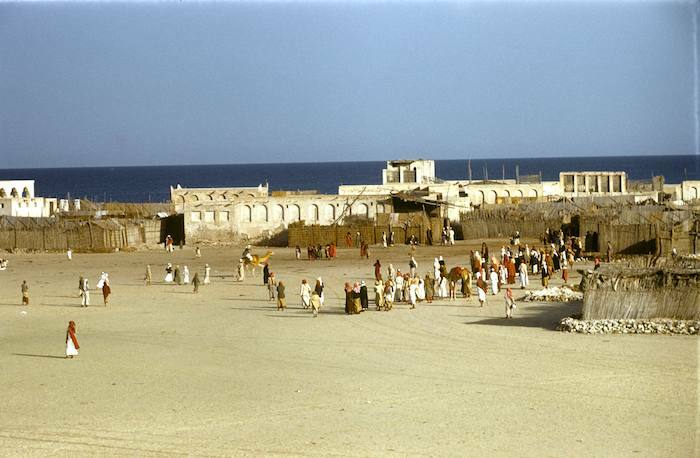 1914-1949 Vernacular Architecture, examining indigenous architectural traditions of the UAE. 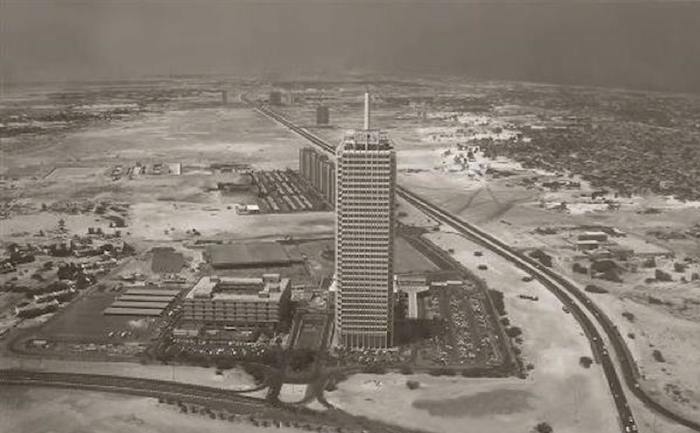 1950-1970 Infrastructure and Urban Development, exploring the early urban master plans of the Emirates of Abu Dhabi, Dubai and Sharjah. 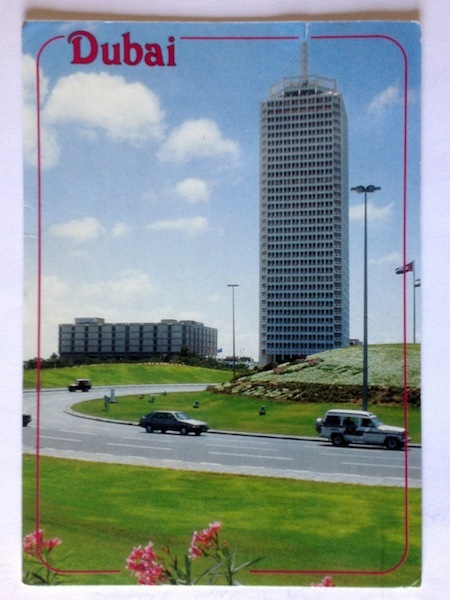 1971-1994 Structures of Modernity, showcasing key buildings from the UAE’s initial encounter with modernity following the union of the Emirates. 1995-2014 Retrospective and Innovation, highlighting conservation and adaptive reuse efforts aimed at preserving modern heritage buildings and planning for a sustainable future. Drawers containing materials like architectural and engineering renderings, documents and photographs. Filmed conversations projected on large screens above the drawers (featuring UAE’s leading professionals in architecture, engineering, education, conservation and culture). A comprehensive timeline with info-graphic maps and diagrams that will correspond to the four periods captured in the drawer units, including significant buildings of the UAE within the context of regional and international political and economic events as well as architectural developments. 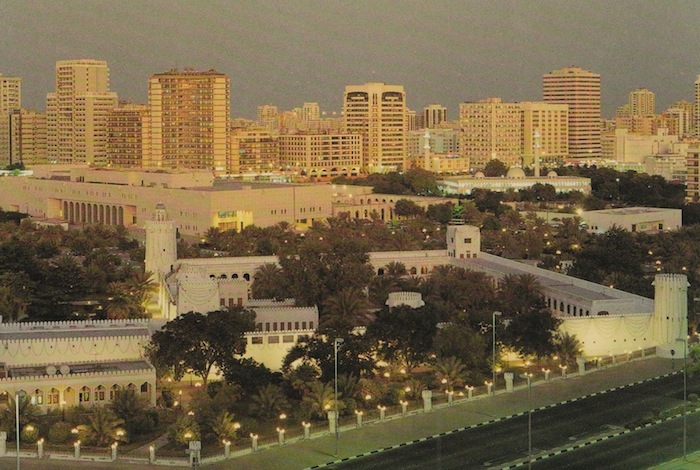 I’m very happy there will be an emphasis on the 1970s-1980s, some of the key buildings that will showcased from that period include the Cultural Foundation and National Library and Zayed Sports Stadium in Abu Dhabi, Dubai's World Trade Centre, Dubai Petroleum’s headquarters and Sharjah's Blue Souq. I also find it ironic there’s a concentrated emphasis on the 1970s-80s architecture considering this is the period that has been and continues to be easily demolished to make way for new developments across the country. When I first heard about the theme "Lest We Forget" at a talk in January this year with Rem Koolhaas, Michel Bambling and Adina Hempel (UAE Pavilion's Head of Research), I felt very were apprehensive about it, especially since this is also a title of a project worked on by students from Zayed University overseen by Bambling from few years ago. I couldn’t help but think why such an elementary approach to this biennale. Here's a quote from an article about the Zayed University project from 2013. Needless to say, I kept wondering who is "we" that will be represented in Venice. An Emirati only point of view of architectural heritage, culture and history, which is normally romanticisied? Or a more academic approach that will give visitors an objective overview of the UAE’s architectural history to help put the present into context that not many (outside and even inside the UAE) really understand, before even looking at the future. . Since then, and after reading more about the UAE Pavilion and having discussions with members from the UAE Pavilion, I’ve been told Lest We Forget is a long term project that will continue its research, part of a "larger initiative to archive the history of architectural and urban development in the UAE over the past century". According to Bambling, "Much of the diverse material has been gathered, created for the exhibition or shown to the public for the first time -- content that is typically hidden within in files of architectural and engineering firms, and in municipal and federal archives, in Emirati family photo albums, on travelers’ post cards, and in photographic collections." The core elements of this exhibition will be in the drawers and visitors will be expected to explore these drawers to find different objects and documents. I have yet to see the pavilion, but based on what was described to me along with the drawings that have been shared, it feels like the pavilion has a very "closed door" feel to it. It’s like a shy teenager that doesn’t really want to talk about itself and will only answer questions when asked. Even the pavilion design concept sketches (featured above) have hints of this closeness. I can see why the the curator would like viewers to discover, engage and interact with the pavilion, but in the context of a biennale – with 66 national pavilions, each one trying to stand out with its own statement, will this work? The biennale doesn’t just attract architects and academics, this edition particularly aims to attract the wider public. Is this year’s participation more about preserving ephemera and memory versus the preservation of physical buildings and locations? I hope the pavilion will help play a role in more than just creating a memory bank. I hope (and wish) it will have a role to play in physically preserving and honouring whatever still remains from the 1970s through to the 1990s, and not by just exhibiting objects, documents, blueprints, and preserving a handful of buildings. 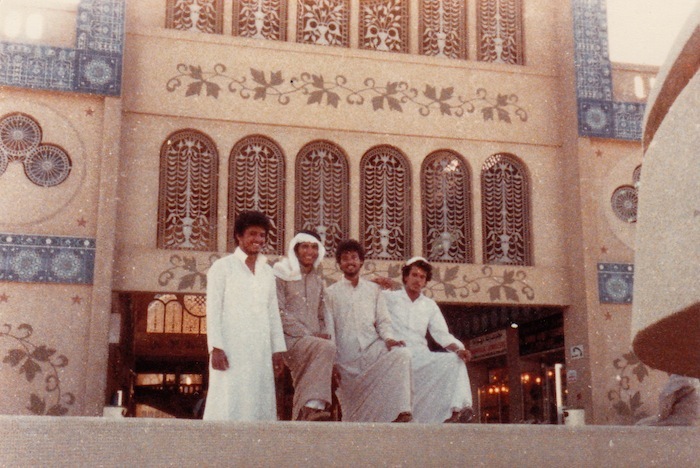 Will the UAE Pavilion succeed in telling its story of absorbing modernity in the past 100 years? I hope so. I am really looking forward to the response it gets after the official opening, and hope I get a chance to visit it myself. During the press meeting I asked what would be recommended to a visitor if she/he had just 30 minutes at the pavilion. The answer was to look at the timeline and based on the period the visitor is interested in, she/he can go to the relevant corresponding drawers that will have more information. On that note – here are some of the featured buildings and objects you will find at the pavilion (all images supplied by the UAE Pavilion). If you go, let me know what you think and I will keep an eye on reviews and feedback from friends that will be attending. The UAE Pavilion will be open to the public from Saturday, 7th June till Sunday, 23rd November 2014, from 10am till 6pm. It is located in Sale d'Armi Nord, Arsenale, Castello, 30122 in Venice. If you are interested in the other participating national pavilions, My Art Guides has put together a very good summary for all 66 pavilions.